Bogor Mayor Bima Arya Sugiarto poses with the city tour bus, Uncal. The newly launched free Bogor city tour bus is set to operate from Friday to Sunday every week. 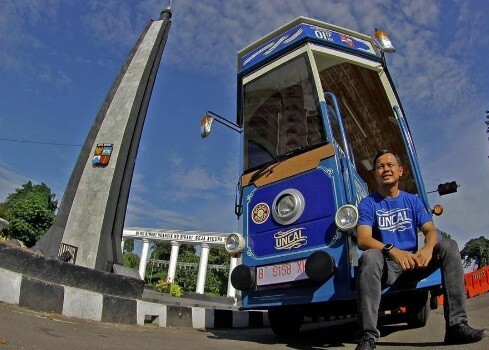 The bus, called Uncal (Unforgettable city tour at lovable city), is scheduled to operate this weekend with stops including the Bogor Botanical Garden and Bogor Palace, said Bogor Mayor Bima Arya Sugiarto on Wednesday. “Since we currently only have one bus available, its operation will be limited from point to point, departing from Botani Square and returning there again, free of charge,” he said as quoted by kompas.com. As Bogor’s first city tour bus, the bright blue-colored vehicle is equipped with 13 two-person passenger seats, meaning it can accommodate a total of 25 passengers per trip. Bima said that the administration planned to gradually add more buses. “We need at least six buses to serve six districts in Bogor,” he said, adding that it encouraged private companies to contribute in providing the buses. The first unit is said to be donated by BJB Bank. The name of the bus is the result of a competition held among Bogor residents. During Uncal’s first weekend in operation, Bima will reportedly be the tour guide and accompany visitors circling the West Java city.